The UK’s largest study into long-term electric vehicle (EV) use reveals an increase in driver confidence, the first real-world analysis on the cost of ‘refuelling’ and fresh information on charging trends. Six months into the CABLED trial (Coventry and Birmingham Low Emission Demonstrators), Aston University’s research reveals that drivers are travelling more miles, more frequently and are undertaking longer journeys1 - indicating increased confidence and notably reduced ‘range anxiety’. Cost conscious prospective electric vehicle drivers may also be interested to learn that the average cost to trial participants recharging at home is between just 25p and £1 per day. The data2, analysed by Aston University combines and compares the behaviour patterns of 25 Mitsubishi i-MiEV drivers over two consecutive quarters. 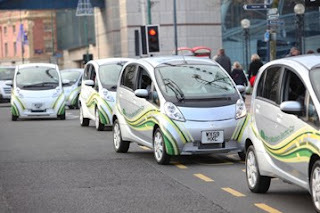 The results form part of the CABLED project, which will see an overall total of 110 ultra low carbon vehicles from different manufacturers, tested on the roads of Birmingham and Coventry as part of a £7.5m year- long Government scheme. Aston has been using the latest in satellite mapping and computer technologies to collate journey data to give a greater understanding into consumer behaviour and to how individual electric vehicles perform in a real world environment. This data will also be used to map out a future network of electric charging points, to further extend range and improve the convenience of electric vehicles. A Mitsubishi i-MiEV can travel around 80 miles when fully charged and on average, drivers are using less than 30% of their total vehicle charge in a typical daily use. The average charge time per i-MiEV vehicle is two hours. This provides sufficient charge for between 20-40 miles of travel at a cost of between 40p to £1, depending on the tariff. The most popular time to charge vehicles is overnight but as around eight in 10 journeys use less than 18% of the battery and five average length journeys could be completed on one charge, there is now evidence to support the need for intelligent technology that will allow electric vehicles to interact with the national grid. Project Leader Neil Butcher from CABLED co-ordinating partner Arup believes the data presents a positive outlook for the mass take-up of electric vehicles. “The phenomenon known as ‘range anxiety’- concern about battery life when undertaking long journeys – is falling as drivers become more familiar with their vehicles. The low cost of ‘refuelling’ in relatively short periods of time reinforce this. While there are technical challenges ahead - such as extending vehicle range and making provision for an increased demand on the national grid - our results show that even current EVs are more than capable of meeting users’ day-to-day needs,” he said.